Not all pet owners choose to spend eternity with their beloved pets, but some try to be buried close by. Princess Elisabeth Vilma LwoffParlaghy (April 15, 1863–August 28, 1923) was eccentric, to say the least. Elisabeth von Parlaghy was born in Hungary, where she became known as a portrait painter. In 1899, she married Russian Prince Lwoff, and though the couple divorced a few years later, she kept his name (and apparently a fair share of his riches). When the princess arrived in New York in 1908, she was reportedly accompanied by two attachés, two couriers, a footman, first and second butlers, first and second lady’s maids, a cook, a valet, and a Swedish nurse. A great animal lover, she also arrived with an assortment of pets, including a small Pomeranian dog, an Angora cat, a guinea pig, an owl, two small alligators, and a bear. When the princess arrived at the Waldorf Astoria Hotel, she was informed of their pet policy, which must not have included the assortment the princess possessed; but arrangements were made for her, her menagerie, and her attendants to stay at the Plaza Hotel. And there she stayed. One day she visited the Ringling Brothers Circus and fell in love with a little lion cub. After some spirited negotiations with the Ringling Brothers and the Plaza, the little lion cub moved in. The princess originally named the cub General Sickles after a Civil War general’s portrait she painted, but the it was eventually named Goldfleck. Alas, Goldfleck was not long for this world. Before he reached full adulthood, he became sick and died. Despite his rather abbreviated time in this realm, he did go out in style. Princess Elisabeth Vilma Lwoff-Parlaghy arranged for a formal wake and a tombstone with a flowery epitaph. 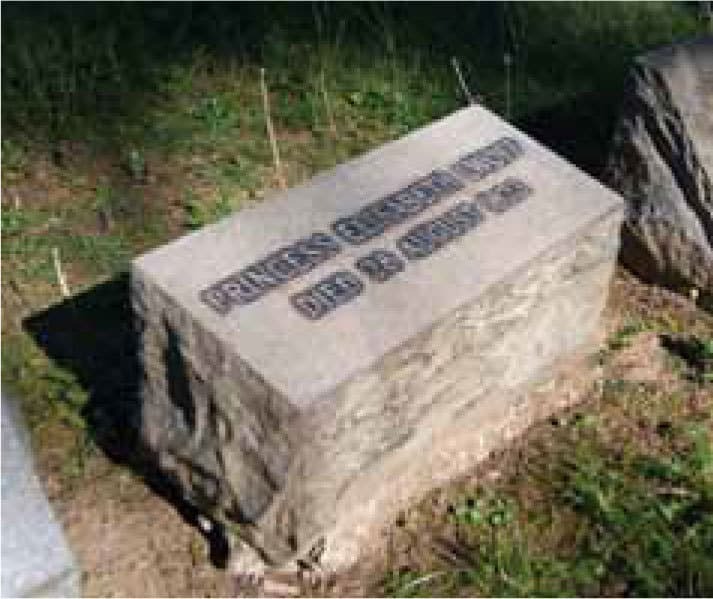 It reads, “Beneath This Stone Is Buried The Beautiful Young Lion Goldfleck, Whose Death Is Sincerely Mourned By His Mistress Princess Lwoff-Parlaghy, New York 1912.” The princess’ gravestone (40 53’3.72″N 73 52’36.72″W) is a simple one at Woodlawn cemetery. It only reveals her death date since true princesses are forever young.